Since 2002, Skyacht Aircraft has been developing the Personal Blimp. The goal of this work has been to create an aircraft capable of quiet, steerable, sustained, and affordable flight. 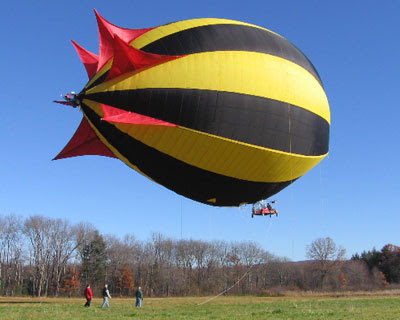 The Personal Blimp is a hot air balloon that can be manoeuvered in near silence. Passengers in a Personal Blimp have a serene experience of flight unavailable in any other type of aircraft. The Personal Blimp can be deflated and folded for storage. The combination of buoyancy control and rapid deflation eliminates the need for hangars and ground crews required for helium airships. With the engine/propeller mounted on the tail, the Personal Blimp can use vectored thrust for steering. This allows greater manoeuverability, particularly for hovering. Since its first flight in October, the Alberto has completed the FAA's required 10 hours of Phase I flight testing. Our work now focuses on both refining its systems and further expanding its capabilities. 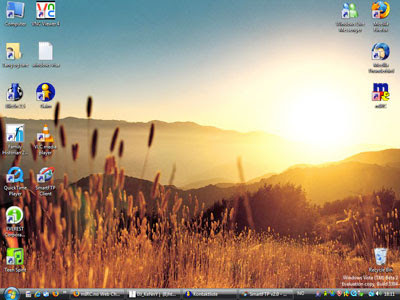 Vista, the latest version of Microsoft's Windows operating system, has finally made its] consumer debut. While reviews have focused on Vista's new functionality, the legal and technical communities have dug into Vista's "fine print." Vista incorporates Windows Defender, an anti-virus program that actively scans computers for "spyware, adware, and other potentially unwanted software." The agreement does not define any of these terms, leaving it to Microsoft to determine what constitutes unwanted software. Once operational, the agreement warns that Windows Defender will, by default, remove software rated "high" or "severe," even though that may result in other software ceasing to work or mistakenly result in the removal of software that is not unwanted. Microsoft reserves all other rights. Microsoft cautions that "you may not work around any technical limitations in the software." Last December, Peter Guttman, a computer scientist at the University of Auckland released a paper [that unravelled] numerous limitations in the new software seemingly installed at the request of Hollywood interests. Guttman focused primarily on the restrictions associated with the ability to play back high-definition content from next-generation DVDs (referred to as "premium content"). 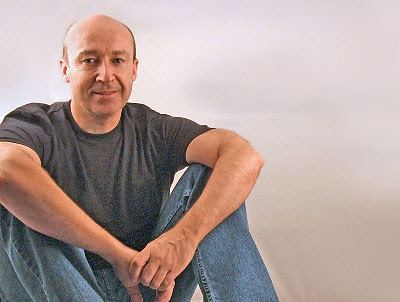 He noted that Vista intentionally degrades the picture quality of premium content when played on most computer monitors. Was there some extra production time available at the iPod Nano anodising plant? 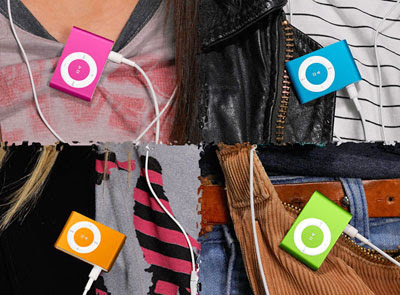 Or are they making these out of recycled 'nano cases? 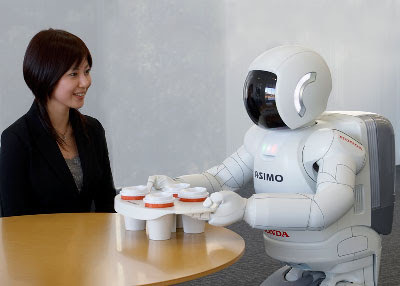 The 2007 Honda ASIMO is the eleventh incarnation of a project that has been running since 1986. Officially, the name is an acronym for "Advanced Step in Innovative MObility". Honda claim that it has nothing to do with Isaac Asimov, and in Japanese, the name is pronounced 'ashimo' meaning 'legs also'. One of Asimo's unique features is that it can walk up and down stairs (although this all went spectacularly wrong at a demonstration last year). He did better at this year's Consumer Electronics Show. For more videos, visit YouTube and search for 'asimo'. And if you're hungry for more, Honda's official site has stacks of information sheets and hi-res pictures. Carvewright has produced a computer-controlled woodworking machine that allows the automated routing of wood in a laser printer-size unit. 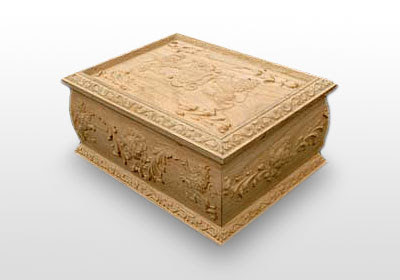 The website has a video of the CarveWright in action, and it is fascinating to see wood being carved with the same kind of ease that an inkjet printer produces photographic images. 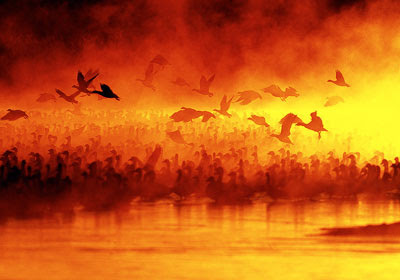 Nature Photographers Online Magazine have published their yearly 'Editor's Pick Awards'. Well worth a browse. 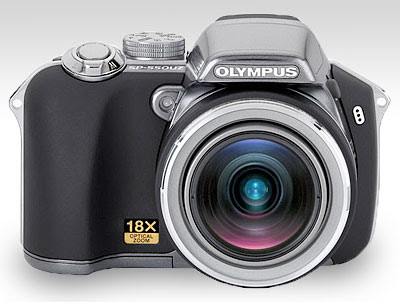 Olympus have just announced the world's first 18x zoom camera. The SP-550 UZ ultrazoom goes from a wide-angle 28mm, to 'super-zoom' (read 'you'd better have steady hands') 504mm range. Fortunately for those of us 'tremblies', it also features CCD-shift image stabilisation, and an ISO range that extends to, wait for it, 5000! At 365g it's not a lightweight, and its 116 x 78.5 x 78mm won't fit in your shirt pocket, but managing to squeeze an 18x zoom into a package that small is quite an achievement. Visit dpreview for full specifications and more detailed images. 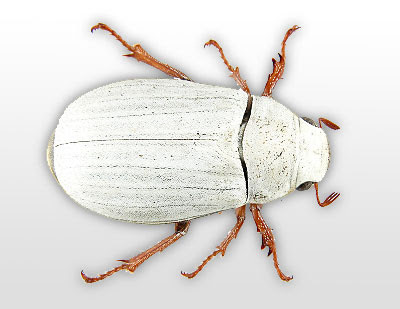 Scientists have identified the source of the dazzling whiteness of a beetle called Cyphochilus, and harnessing that knowledge could help make everything from paints to t-shirts more blindingly white. Electron microscopy revealed the scales are made of a tangle of seemingly randomly orientated filaments, each about 250 nanometers wide. A random microscopic structure is key to producing a white colour, which results when all wavelengths of light scatter equally from a surface. The brightness of the colour results from gaps of air between the filaments. Light scatters every time it passes between two materials that differ greatly in the speed of light through them, also called their refractive index. Like facets in a diamond, the more places light can scatter, the brighter the ultimate colour. 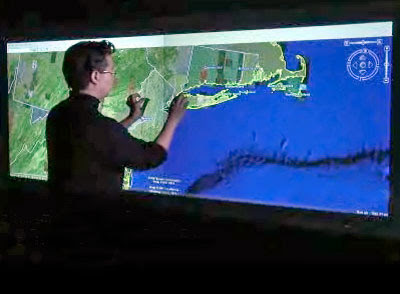 In August, I blogged a fascinating demo of Jeff Han's user interface ideas. Well, he's still around. Ignore the (15 second, but seems MUCH longer) preliminary ad, and see that he's taken things a few steps further. If you want to read more about it, and can bear the 'gosh, wow' style of reporting, there's an (overly long) article at fastcompany.com. According to the article, Han has sold his first wall screen to the US military, and has a lot of other deals in the pipeline. With his obvious love of publicity, we'll probably be seeing a lot more of him in the future. An international team of scientists is developing what they say will be the world's first microrobot - the width of two human hairs - that can swim through the arteries and digestive system (the motor, ringed in red, is the size of a grain of salt). The scientists are designing the 250-micron device to transmit images and deliver microscopic payloads to parts of the body outside the reach of existing catheter technology. It will also perform minimally invasive microsurgeries, said James Friend of the Micro/Nanophysics Research Laboratory at Australia's Monash University, who leads the team. The researchers hope the device will reduce the risks normally associated with delicate surgical procedures. Funded by the Australian Research Council, Friend's team is tweaking larger versions of the device, and expects to have a working prototype later this year and a completed version by 2009. The scientists say stroke, embolism and vascular-disease patients should be the first to benefit from the new technology. 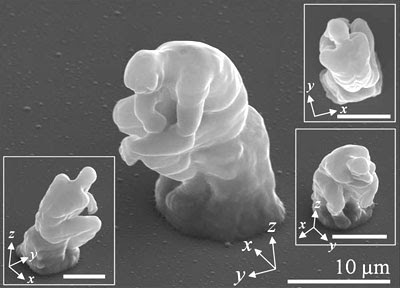 The microrobot's design is based on the E. coli bacterium, complete with flagella that will propel it through the body. Scientists will make the flagella out of human hair in the preliminary research stages, eventually they want to use Kevlar. 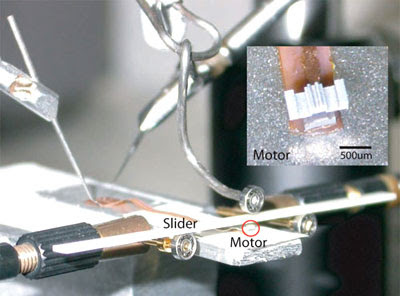 The piezoelectric materials vibrate a twisted microstructure inside the robot at ultrasonic frequencies. When the twisted structure is compressed against the rotor, it untwists and the rotor turns. As the compression is released, the twisted structure unwinds back to its original shape, while the rotor slides. 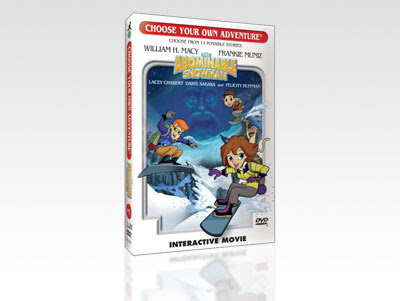 Download The Abominable Snowman, free! For those of you scarcely out of the womb,'Choose Your Own Adventure' was the title of a series of books published by Bantam from 1979 to 1998. It is one of the most successful series of all time, selling over 250 million copies. 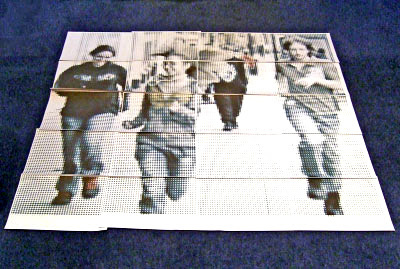 Each story was written in the second-person, with the reader playing the role of the main character. The innovative feature was that the reader was given choices of how the story should progress, e.g. "If you want to enter the room, turn to page 17. If you want to turn back, turn to page 23." CYOA have now made the stories available in iPod format, and one of the titles, 'The Abominable Snowman' is available for free download. Read by R.A. Montgomery, it contains the original 116 pages of text, colour illustrations and sound effects. In recent years, a number of compact, high-performance digital cameras have appeared on the market, but there was a direct trade-off between zoom power and camera size. 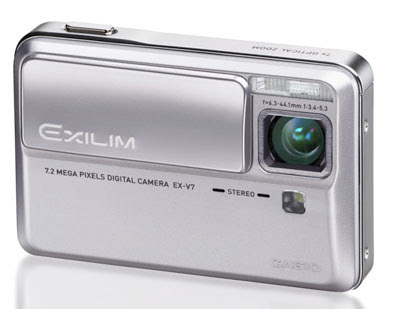 Users who wanted to capture subjects at a distance were forced to buy bulkier cameras or sacrifice zoom range for portability. 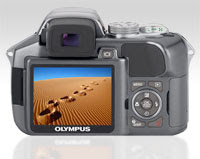 The camera introduces an innovative function for reducing photo blur, utilising mechanical CCD shift technology. It also combines Casio’s Anti Shake DSP with new motion analysis technology that selects the most appropriate ISO sensitivity and shutter speed to capture a moving photo subject. It will be available in the States around March, for about $399.99. 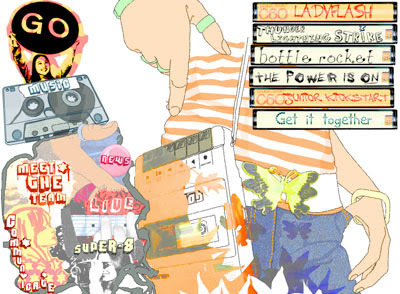 Reloda has a couple of free tracks from the Go! Team, a multi-national bunch of musicians who sample, mix and homage everything from pop to electroclash, 70s TV themes to Bollywood, cheerleading chants to hip hop... with everything louder than everything else. And, if you needed any more convincing, there’s four drummers in the group. That's like having the Glitter Band (without Gary, natch) AND Adam Ant's rhythm sections in the background (and very often the foreground!)... the drumming sometimes gets so messy that I find myself smiling out loud. Give 'em a try. There has been little development of the toaster since the start of the century, while other appliances have developed and improved, incorporating new technologies and thinking, the toaster has remained relatively untouched. When the toaster was first invented eating toast was a social activity that took place at the breakfast table. These days, toasters have been relegated to objects hidden away in the kitchen landscape. This toaster is designed to engage the user, re-invigorating the social context of toasting by questioning everything about what we toast with today. I was also keen to make a playful object that you would be proud of having on your breakfast table. Slip-moulded bone china allowed me to create this intricate and sculptural form, but also provided the material longevity that I required. 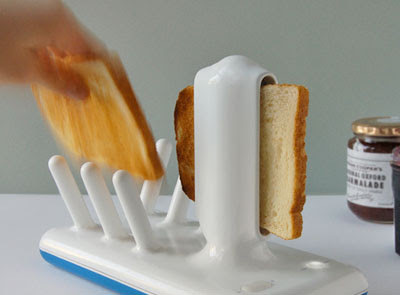 This is a toaster that brings life and joy to a stagnant domestic appliance. Eric Grohe was born in New York City in 1944. His professional career as a graphic designer and illustrator began in Seattle in 1961, briefly interrupted by a tour of duty in Vietnam. Back at home, Eric was hired as a graphic designer by a national architectural firm. Later he worked with the Cambridge University archaeology department, illustrating digs in France, Greece, Israel and England. Returning stateside, Eric worked in New York City as a freelance illustrator. In 1973, he was asked to design graphics for Expo’74 in Spokane, Washington. 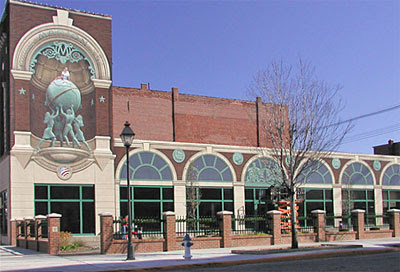 At this time, he began receiving commissions for his artwork, which have continued to grow in scope and size, leading to today’s large-scale trompe l’oeil murals. Throughout his 43-year career as a professional artist, Grohe has received national recognition for his work, which is now focused on painting figurative and architectural murals for clients throughout the United States. Pay his site a visit, the quality and scale of the murals is breathtaking. Thanks to Chantal, via Gareth, for the link. Shout if you want to go faster! Christopher Paretti has found a way to link voice patterns to the acceleration controllers on electric slot car tracks. 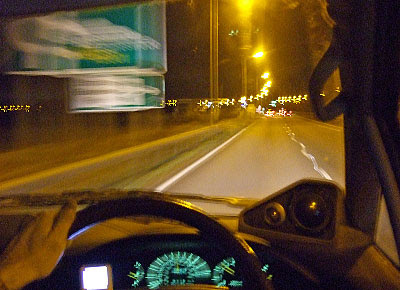 So, the louder you yell, the faster your car goes... and if you stop, so does the car! It's one of those ideas that probably seemed like a good idea at the time. However, I can see the novelty wearing off fairly quickly once you have a room-full of overexcited kids all screaming at the top of their lungs. 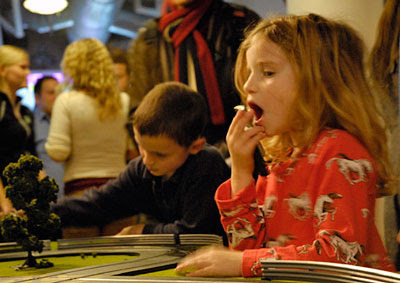 He doesn't say whether he's planning to turn his attentions to solving the major challenge for anyone playing electric slot-cars... the ubiquitous broken connections that plagued my youthful experiences with this particular activity! Korean researchers have crafted a 20 millionths of a meter high version of Rodin's famed sculpture The Thinker. That's only twice the size of a red blood cell (and 93,000 times smaller than the original). For more than a decade, researchers worldwide have experimented with lasers to fabricate elaborate 3D creations. They start with a resin that hardens when exposed to certain frequencies of light. Using overlapping beams of lasers, they solidify a sculpture with details measuring less than a wavelength of visible light. While the skins of these sculptures are hard, their innards remain soft. This leaves them vulnerable to surface tension, the same force that causes water to bead up into droplets. The surface tension of the fluid in which the sculptures are immersed can cause them to deform. To solve this problem mechanical engineer Dong-Yol Yang at the Korea Advanced Institute of Science and Technology in Daejeon, South Korea, and his colleagues use multiple laser beams focused at and below each spot on the surface of the sculpture. The new technique could help develop biosensors and other complicated microscopic devices. 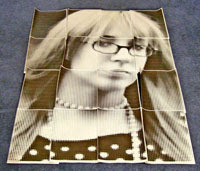 The *nervous cough* Rasterbator is an online tool where you can upload a JPEG (up to 1MB) and it will produce a half-toned PDF version that you can print on many sheets of paper to make a bigger, tiled image. It is fun and intuitive to use. You can either upload a file from your computer or specify its URL. After you have cropped the image and selected the size and number of pages you want to print, the tiled images are constructed as a downloadable multi-page PDF file. Steve Jobs has ended years of speculation by announcing the iPhone. It is an elegant looking unit, about the size of a medium-size Pocket PC. It does all the mobile phone, iPod, email and web-browsing stuff. But the jewel in the crown is that they've given it a decent operating system (Mac OSX). The bad news is that it isn't due for release until June in the States, and Europe has to wait until Christmas! Now I've got to keep my Nokia 6210 working until I get my hands on one. 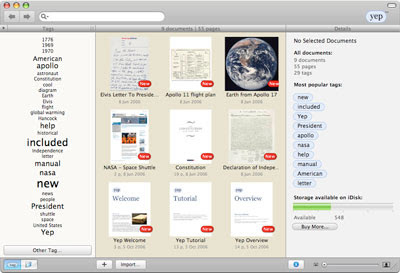 Yep (Mac OSX only) is a free (at the moment) program that helps you organise your PDFs. Every computer has loads of PDF files. Use Yep to search, view and manage these documents. Think of Yep as iPhoto for your PDF documents. Paul Bates sent a Christmas card to a long-lost pal in this envelope with NO street name, NO town, NO postcode — yet it arrived! The steel worker, 48, had forgotten the name of the town workmate Peter O’Leary moved to from Neath, South Wales, three years ago. But he recalled Peter had pointed it out on a map. 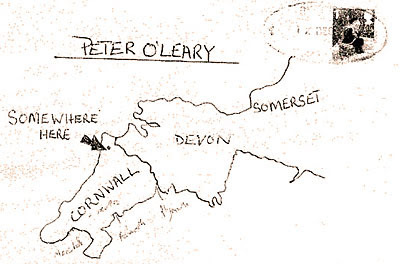 So he put a dot on a sketch of the South West Peninsula, wrote “somewhere here” and hoped for the best. Amazingly the card arrived at Peter’s home in Bude, North Cornwall, nine days later — after his postie recognised the name in a local sorting office. 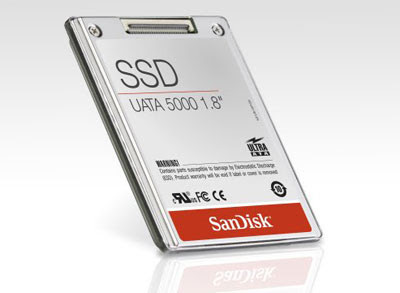 Sandisk has begun production of a 1.8", 32GB flash-based hard drive. 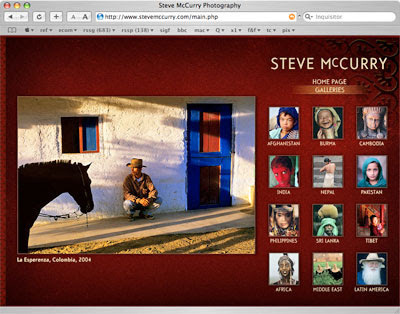 Steven McCurry is a superb photographer. Be prepared to spend more time than you planned browsing his site! Each year, it asks a single question and publishes the responses online. The 150 responses cover a wide range of subjects, from string theory to intelligence, cancer to climate. Among the contributors are such luminaries as Richard Dawkins, Freeman Dyson, Ray Kurzweil and Steven Pinker. 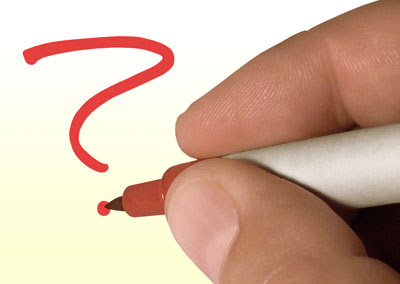 Visit Edge.org for a quick browse (or a lengthy perusal) of their answers. You'll find stuff that gives you reason to smile, along with material that will have you reaching for the nearest throwable object. But it will make you think. Tobi Gutt left Germany in high hopes on Saturday, dressed in T-shirt and shorts for the Australian summer, but instead of heading towards Sydney, Australia the 21 year-old ended up en-route to Sidney, Montana. 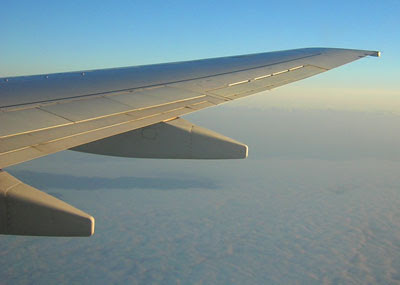 Initially Gutt reasoned that it was possible to fly to Australia via the United States and it was only once he was on board a commuter flight to Sidney, an oil town that's home to around 5,000 people, that the terrible truth dawned on him. Up to that point he's flown to Portland, Oregon and on to Billings, Montana with mounting concern. "I did wonder but I didn't want to say anything," Gutt told the German newspaper Bild. "I thought to myself, you can fly to Australia via the United States." He was left stuck middle of nowhere with only a thin jacket to keep out the cold. Fortunately after three days his family and friends were able to send him the €600 he needed to book a new ticket to Australia. "I didn't notice the mistake as my son is usually good with computers," his mum, Sabine, told Reuters. Last year I started a blog [yes, this one, ed]. I was surprised at how much I enjoyed maintaining it, and how many people enjoyed viewing it. It is essentially a 'I found this cool stuff and thought I'd share it' kind of site, and I'll continue publishing it until I get bored with it. A number of people have said they would like to hear a little more about what I think of life [no, really, they did] . This will be the site for them. The aim will be for it to publish a couple of ideas a week based on my own personal experience. The topics will be unashamedly 'Brett-shaped', and will make no claims to be scientific or exhaustively researched. Comments are enabled, and welcomed.